[ETA]: FF reader Emmy from France was lucky to attend the Paris 'Shame' premiere the other day and is kind to share her fantastic experience with us. If you read the comment section of this entry, you will find her post. For reader convenience, I am posting a link to her website where you will find her lovely pictures, and 3 great videos! At the website, the text is in French, so definitely read her comments here. Congratulations Emmy on hanging out with Michael and enjoying Shame and having a ONCE in a lifetime experience! Merci! 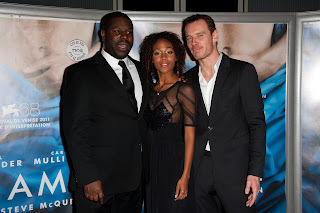 Michael Fassbender, Steve McQueen, and Nicole Beharie were all in attendance last night for the Paris premiere of 'Shame'. It's really too bad that Carey Mulligan has been down in Australia all this time filming the Great Gatsby, preventing her from attending just one premiere. People would have loved to seen her there. I think I like the French's Shame posters better than the U.S. ones. I saw today for the first time the trailer in a Paris theatre... very intense ! 7/12/11 is the day ! I can't wait !! I'm so sad I didn't know about the Paris premiere!!! I could have seen him!!! Hey guys ! So I'm a total fassinator who live in Paris, so I had the wonderful opportunity to see Shame and especially to meet Michael the 22th of November at the Shame Paris Premiere. Actually, I'd love to tell you every single detail of that incredible evening but as you can see my English is not very fluent at all ^^. Brandon is a very daring role !!! 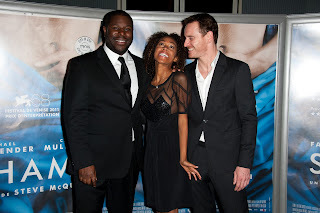 After crying so much, I had the incredible chance to participate in a cocktail with Steve, Michael and Nicole Beharie. The cocktail was fantastic. While I was posing with the Shame Poster, Nicole came to me and posed with me. That's was hilarious and so funny. After this I posed with her a second time. She is adorable :) ! And I must say that Michael and Nicole was very close during the Premiere and the Cocktail :))). But the most incredible and amazing thing, was that I saw Michael drunk ^^. He is so relaxed but especially so CUTE (OMG) when he is drunk ^^. He was talking with people around him (some of his fans for example...). Just before he left the cocktail, I had the amazing courage (it was very difficult for me because I'm very shy ^^ but I had a feeling I would regret it if I didn't.) to talk to him. I just said out loud "Michael" and he immediately turn back, came to me, and shook my hand. I told him that he has turkish fans too and to come to Turkey as well. (I'm french and Turkish). He said to me "Okay, that's fantastic" and smile to me with his BIG smile, I did the same and that's all ^^. 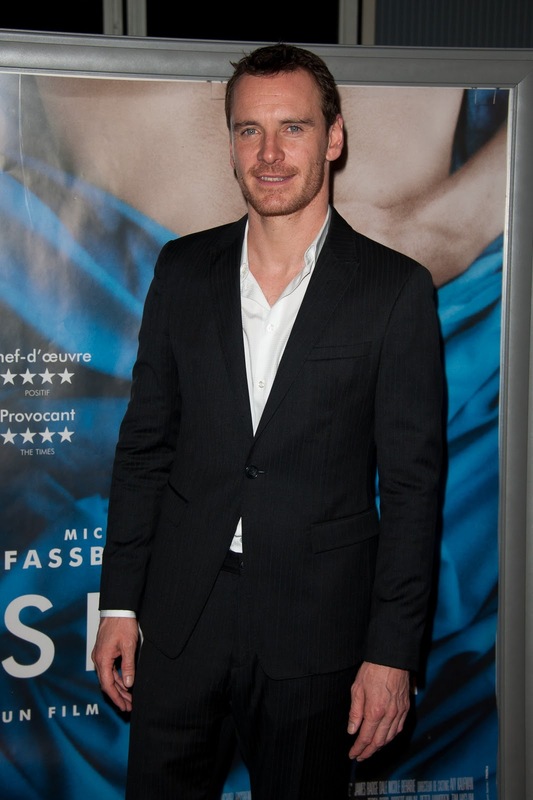 I have a wonderful, a magical day with Fassy ^^. That was amazing. It's something I would never forget for sure LOL. If you have some questions about this, you can ask me and I will try to answer you with my best :). I forgat to precise that Michael is sooo nice with his fans. He is incredible with his fans but I'm sure you already know this ^^. Emmy, Wow, just WOW!!! When you emailed me about this, I had no idea the extent to your meeting with Michael. This is incredible, I'm so impressed and happy for you! Please, tell us about how you got invited to the cocktail party with the Shame group? That's incredible! and the third for the guests. I had with my mum 2 tickets for the screening at 8 PM. But suddenly, at 7 PM, everybody began to leave the red carpet and began to take their place in the screen. I didn't understand what's happening so I asked to a staff whos was in charged with the press and she said to me that I could wait here to see Michael and Steve but that they are going to come later and so I had to choose to see Michael in person or to watch the movie. I definitely chose Michael of course. While we were waiting them, another person in charge came toward us and said to us that there were still tickets for the screening at 8:30 PM. And she also said that we can see Michael & Steve and after to go to see the movie. I was very glad to learn that I will be able to meet Michael and to see Shame. At 8:40 PM, Michael, Steve and Nicole showed up. There weren't too much fans waiting because there were many fans who didn't understand and took their place for the first screening. That's how me and my mum join them at the cocktail party with the Shame group ^^. WOW that was difficult to explain this in English lol. Indeed, we were awarded for being patient LOL. I read about the fan encounter on her blog using Google translator! Very nice, Emmy! Michael always seems so nice and generous to his fans. I'm so happy for you! Hi Emmy, wow! You're so very lucky and I could only imagine the excitement! Congratulations Emmy on meeting Michael and thank you for sharing this wonderful encounter with us. Also do not worry about your English it is very good.